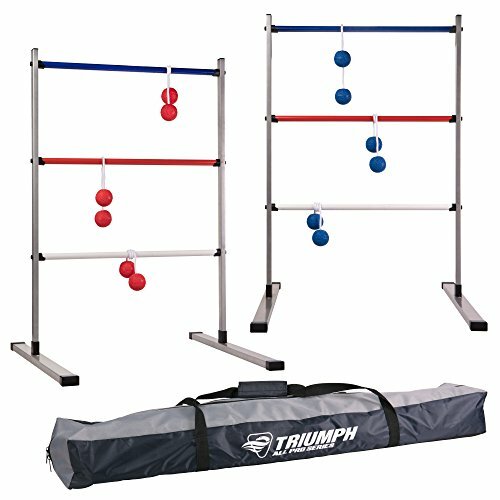 The Triumph All Pro Series Press Fit Ladderball assembles in seconds. At around 6 pounds per frame the ladders are very stable during play. This 36” H x 23” W all-metal set features efficient compression fit connectors that eliminate the need for thumb screws or any extra small parts that can get lost when packaging and unpacking. The durable, metal frame is built to withstand years of competitive play. The metal crossbars insert onto molded fittings that are pre-installed into the metal uprights. Attach the uprights to the bases, insert all three crossbars into the fittings on one upright, then connect the other side of the ladder to the other end of the crossbars and you’re ready to play. Six soft ball bolas are included in this set (three blue and three red bolas). When finished playing, the metal frame components and the bolas pack inside a durable carry bag for convenient storage and transportation. Enjoy playing outside in any open space with the easiest setup available.